Digital scales can be useful for monitoring baby weight gain when transitioning from bottle-feeding to exclusive breastfeeding. They can also be appropriate for monitoring slow-to-gain babies. In situations where a baby is not gaining satisfactorily, it is very important to stay in touch with the lactation consultant and pediatrician. 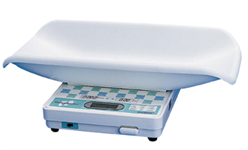 This scale is appropriate for daily weights for infants up to 20 pounds and toddlers up to 40 pounds. It is accurate to .5 oz, and is portable and easy-to-use. It is not suitable for pre and post-feed weights. $3/day, $15/week, $40/month.